1944 Federal Republic of Germany - nice mint never hinged lot with predominantly blocks of four from the fifty and sixties years in the ring binder accommodated. As well numerous popular issues, a great many blocks of four from the corner and so on. With also Germanic museum in the mint never hinged corner margin block of four top left, St. MaryÂ´s Church in horizontal pairs (a value 20 Pfg. Slightly stuck), Otto engine with two vertical mint never hinged pairs, Ifraba in horizontal pairs mint never hinged from margin respectively corner margin, Westropa 1955 in mint never hinged upper margin blocks of four and numerous further issues. A nice lot! 1954 /⊙ Federal Republic of Germany - 1949 / 96, very nice collection in five green Lindner T hingeless printed form ring binder formed. The collection is complete mint never hinged available without posthorn set with all beginning valued including Lower House of German Parliament 1949, 100 years stamps, all sets helper of human resources, Heuss 1954, Heuss fluorescent and watermark sideways. Furthermore is as well a complete neat cancelled collection included. Superb collection! Michel approximate 9000,- €and original price the albums approximate 800,- €. 1963 /⊙/ Federal Republic of Germany - 1949 / 56, extensive lot in the stockbook, with only first issues, mainly mint never hinged respectively used, very few unused. As well better issues as for instance Lower House of German Parliament 1949, 30 Pfg. Welfare 1949, posthorn values including blocks of four and multiples, welfare 1953 / 55 including margin copies and corners of the sheet and so on. Enormous catalog value! 2005 ⊙ Federal Republic of Germany - 1949 / 2006, nice used collection, except for very few insignificant values the modern age in the number of a major listing complete, without Heuss fluorescent / watermark sideways, as well all issues of the early years including Lower House of German Parliament 1949, 100 years stamps, Stephan, all sets helper of human resources, St. MaryÂ´s Church, all souvenir sheets and so on. Also numerous stamp booklet and miniature sheet are available. All clean formed in two beautiful blue Schaubek illustrated albums. Michel approximate 5200,- €. 2006 ⊙ Federal Republic of Germany - 1961 / 2003, nice used collection from horizontal pairs the postage stamp issues in a large stockbook. Also the issue important German complete including both paper types, small buildings complete, Brandenburg Gate, all 21 values Heinemann, prevention of accidents complete, castle and palace, woman abundant, as well a nice part sights. Magnificent object! 2013 ⊙ Federal Republic of Germany - nice lot of miniature sheet of the stamps issue sights in the ring binder, including high denomination value to 4, 10 Euro mostly with first day cancel`s from Frankfurt respectively Berlin. Post price approximate 1100,- €. 2040 /⊙/FDC Federal Republic of Germany - 1981 / 2000, very nice and extensive collection the first days collection pages in 31 corresponding ring binder accommodated. Included are the stamps mint never hinged, with first day special cancellations and on illustrated First Day Covers. By some few pages of the year 2000 samples the mint never hinged stamps slightly to complete. A very nice object with a gigantic subscription price from approximate 10000,- DM. 2042 /⊙ Federal Republic of Germany - 1949 / 66, rich collection in a large stockbook formed, both mint never hinged as also used led and in each case except for the posthorn set and 10 Pfg. Lower House of German Parliament used complete with all good issues including Lower House of German Parliament mint never hinged, 100 years stamps mint never hinged and used, all sets helper of human resources mint never hinged and used, Bach seals mint never hinged and used, St. MaryÂ´s Church mint never hinged and used and so on, without Heuss fluorescent / watermark sideways. Michel approximate 4500,- €. 2045 /⊙/ Federal Republic of Germany - 1949 / 2000, very extensive lot in a large thick stockbook accommodated with an enormous amount of material, often stacked closely one above the other. With also numerous first issues as for instance welfare 1949, St. MaryÂ´s Church, transport exhibition 1953, as well many further issues from the fifties, welfare and youth sets and so on. Huge catalogue value! 2051 /⊙/ Federal Republic of Germany - 1949 / 2000, extensive collection in two thick brown lighthouse hingeless printed form ring binder formed. The collection is to 1999 complete without Heuss watermark sideways. 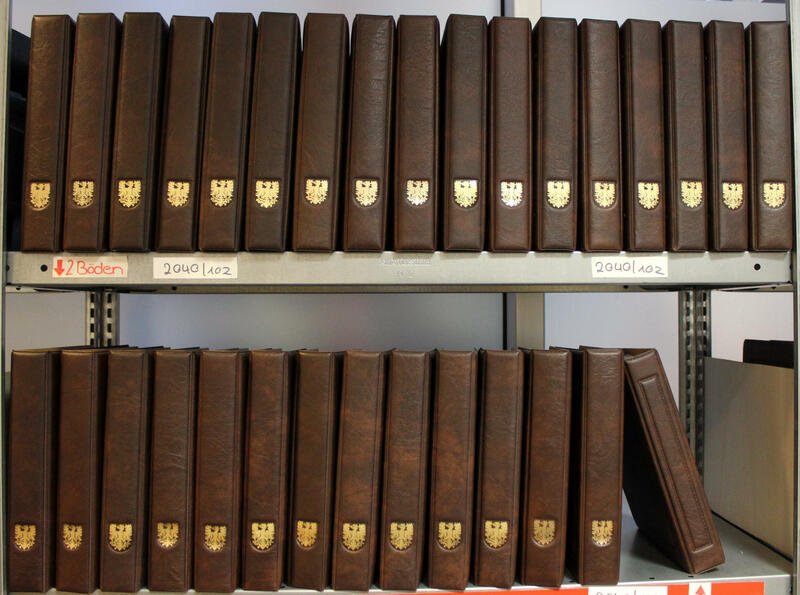 With also all first issues from Lower House of German Parliament 1949 including 100 years stamps, all sets helper of human resources, Bach seals, St. MaryÂ´s Church, Wuppertal series, Heuss fluorescent and so on, predominantly mint never hinged respectively used collected, very few unused. Enormous catalog value, original price the albums already approximate 300,- €. 2053 Federal Republic of Germany - very extensive mint never hinged inventory in 11 large stock books accommodated and in stock created with an enormous amount of material, with also numerous se-tenants from Heuss with sought-after combinations, as well also a huge number blocks of four including many margin copies and corners of the sheet, welfare and youth sets, form numbers and so on. The number of blocks of four from the corner is enormously. Very favorable! 2065 /⊙/ Federal Republic of Germany - 1949 / 69, rich collection, in the number of a major listing complete in the safe hingeless printed form ring binder with all good issues of the early years including Lower House of German Parliament 1949, 100 years stamps, Stephan, all sets helper of human resources, Bach seals, St. MaryÂ´s Church, 70-80 Pfg. Posthorn unused, Wuppertal series and so on. Very favorable! 2069 /⊙/ Federal Republic of Germany - 1949 / 73, nice collection in three Lindner hingeless printed form ring binder, partly even twice collected. Included are numerous better issues of the early years in mint never hinged condition including 100 years stamps, Wuppertal series, welfare 1952, Heuss 1954 and so on. Also a great many issues are from upper margin available. A beautiful object! 2072 Federal Republic of Germany - 1954 / 2000, enormously extensive inventory from mint never hinged issues in three large thick stock books accommodated with a gigantic amount of material, partly close one above the other puted, as well numerous special- and commemorative issues, welfare and youth sets, numerous corners of the sheet, souvenir sheets and so on. Michel approximate 6000,- €. 2074 Federal Republic of Germany - extensive mint never hinged inventory in four Lindner ring binder with lots of material from the years 1959 / 2000. As well numerous complete sets, welfare and youth sets, margin copies and corners of the sheet, souvenir sheets and so on. Huge catalogue value! 2083 /⊙/ Federal Republic of Germany - 1949 / 97, extensive collection in three Lindner hingeless printed form ring binder, much more than complete formed, a great many issues are in both conditions available. Included naturally also all first issues including the good welfare series and so on. There are also a great many issues with beautiful centered philatelic agency cancel from Frankfurt available. Huge catalogue value, very favorable! 2087 /⊙/ Federal Republic of Germany - enormously extensive inventory in four large thick stock books accommodated, in stock created, often stacked closely one above the other from 1949. With also first issues including Lower House of German Parliament, Wuppertal series, transport exhibition 1953, welfare 1953 and enormously much further material. Enormously high, five-digit catalogue value! 2088 /⊙/ Federal Republic of Germany - extensive inventory in six albums / stock books accommodated with lots of material from the beginning years. With also numerous legitimately cancelled se-tenants posthorn and Heuss (enormous catalog value! ), a rich collection in the album with mounts with useful issues, with also Lower House of German Parliament, welfare 1949, Wuppertal series, Heuss 1954, furthermore also numerous souvenir sheets and so on. Huge catalogue value! 2090 ⊙ Federal Republic of Germany - 1992 / 2001, nice used collection with philatelic agency cancel in the KABE illustrated album, except for few issues complete. Michel approximate 1000,- €. 2098 Federal Republic of Germany - 1949 / 68, rich collection, almost exclusively mint never hinged formed in the Schaubek hingeless illustrated album with a lot of better issues. With also Lower House of German Parliament 1949, 100 years stamps, Stephan, welfare 1949, Bach seals, welfare 1952 / 55, youth 1952 and many further issues. Favorable valued!